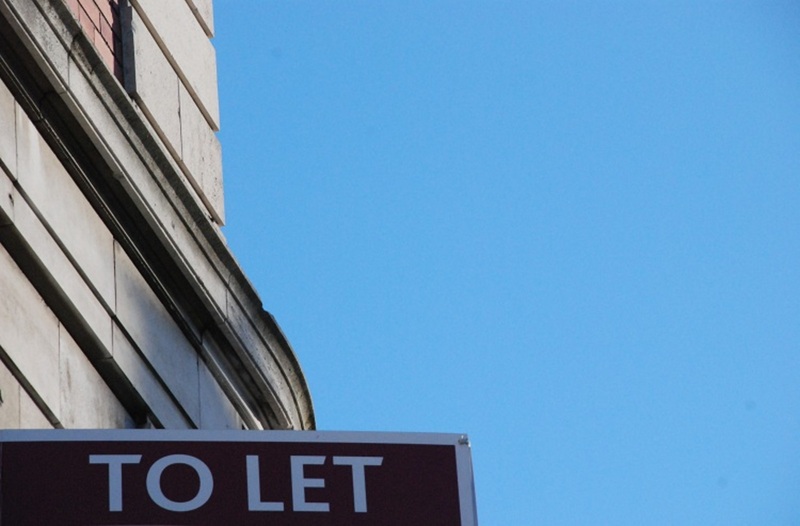 Temple Bar and the nearby area might get some more love soon. 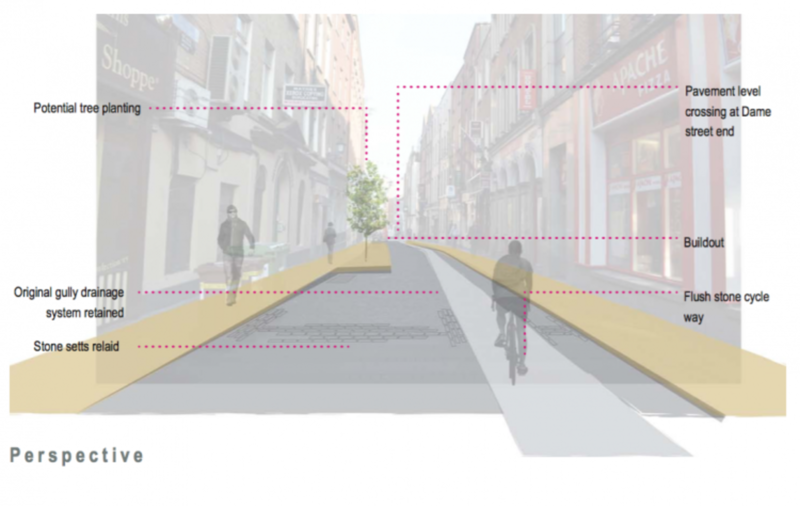 On Monday, landscape architect Daibhi McDomhnaill presented plans to councillors at the South East Local Area Committee to improve the streets and spaces in the neighbourhood with all kinds of measures that would give more room to pedestrians, create more spaces to sit down, and allow people to move more smoothly through the streets. Barnardo Square may get a makeover to enliven the space with tables-and-chairs and trees on one side, which would free up the centre to be used as an events space from time to time. The park at John’s Lane and Christchurch Park would be opened up and remodelled. “There’s scope to create a very usable events space at the top of the park,” he said. For Temple Bar Square itself, a steering group has been set up, said McDomhnaill. A design team should be appointed by early next year, and then later any plans will go out to public consultation. “It’s a very complex space with an awful lot going on so it merits much more rigorous consideration,” he said. 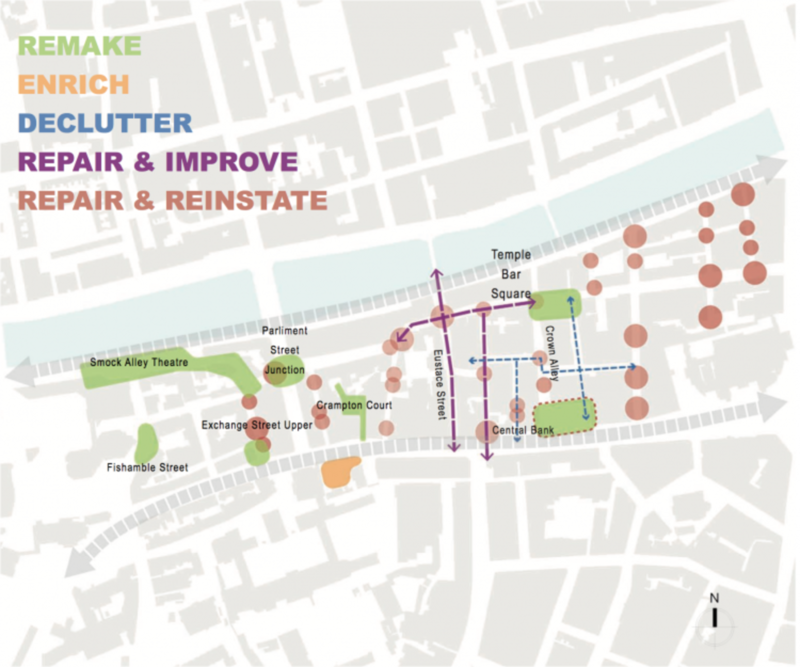 “Broadly (…) a lot of the pedestrian network through Temple Bar is quite tight, the footpaths are quite narrow,” said McDomhnaill. So some of the changes involve building out the footpath in places such as Eustace Street. Not everybody is a fan of the cobblestones, or stone setts, which line the streets of the area. The gaps between them make it difficult for wheelchair users, people with buggies, and cyclists to navigate the lanes. Re-laying them with more narrow spacing, and also laying a band of smooth paving through some of the streets, would help to deal with that, he said. At Monday’s meeting, Dublin City Councillor Mary Freehill, of Labour, said she doesn’t understand why the cobblestones are there at all. “I think our ancestors got rid of these for a darn good reason,” she said. 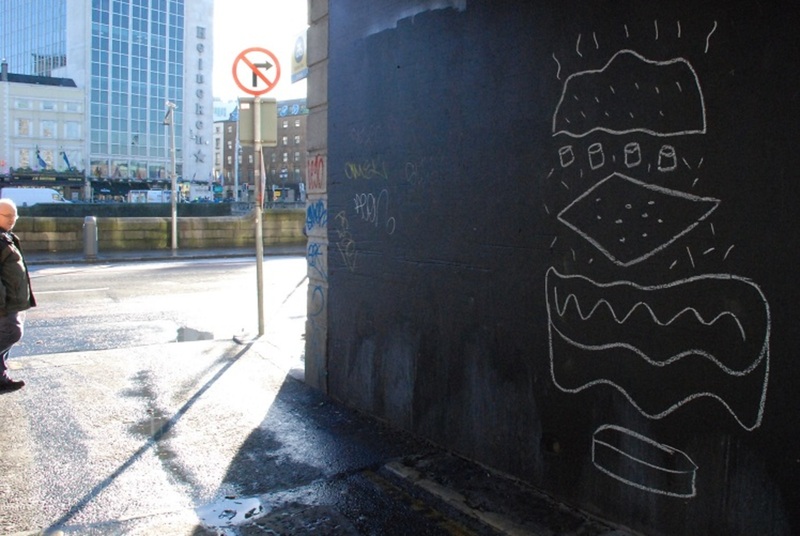 Public seating can sometimes be controversial, as there are fears that it will attract anti-social behaviour, said McDomhnaill. “Nonetheless, I think there’s a determined view that a quality public realm must have places for resting (…) to make the public realm comfortable and accessible for all,” he said. Hence the plan is to provide public seating where needed. Councillors were generally supportive of that. 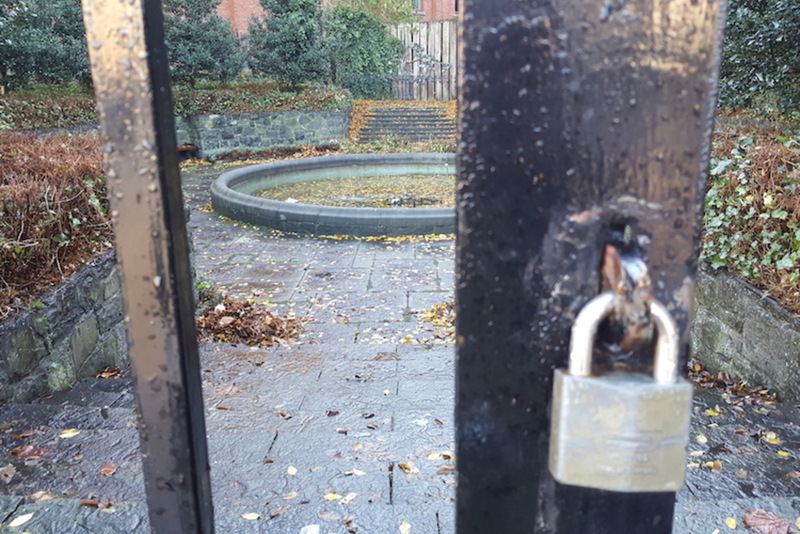 Councillors voiced concerns about anti-social behaviour in the Temple Bar area, and the effect in particular on local residents in places such as Borris Court. While council officials said they were aware of these issues, they also said there is only so much they can do to deal with them through physical design. “There is actually a limit to what we can do in terms of the actual design of the spaces,” said landscape architect Peter Leonard. The raised Temple Bar Square space is just plain tacky and ugly. They should tear out the whole thing. Once again, this white stonework just looks miserable in the rain and is never cleaned. The cobbles are a nightmare to walk on, never mind cycle – massive gaps in them and full of glass. Proper cobbles are meant to be even and tightly laid out, not with massive gaps that trip you up. They could seriously do with closing off many of the middle lanes or something as they are just full of human excrement and urine – every time I see a tourist sitting or leaning against a wall I shudder to think what they putting their hands on. It’s pretty crazy that cars should need to be allowed down every single side street in Dublin, but I understand this is mainly down to the stupid allocation of car parks bang in the middle of Temple Bar rather than away from the middle of the city center. I can’t see tree planting working – these will just be havens for hiding drugs in as elsewhere or hanging out of. I can’t see cycle lanes working either as cyclists will just be slammed into by drunk falling over or pushing them – a landing on hard cobbles would not be pretty. The design of Temple bar square is good in bricks-and-mortar terms (ie -the expensive stuff). 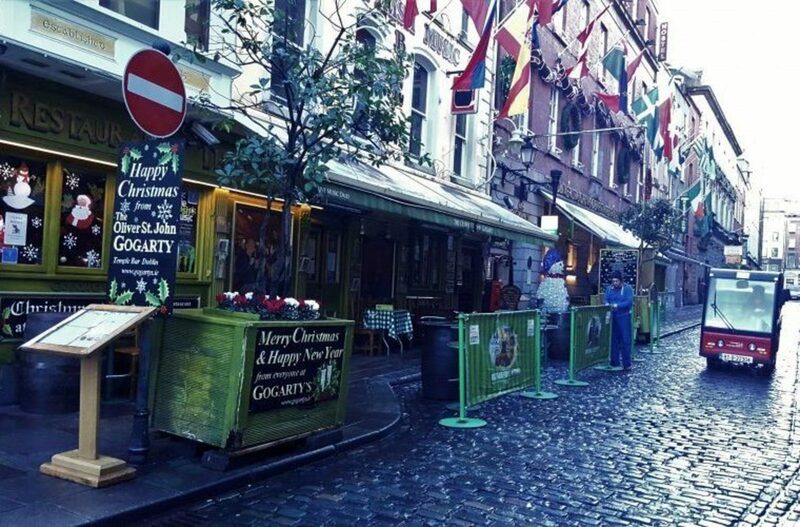 What IS “tacky and ugly” are all the huge signage, banners, flags, and sandwich boards that are ILLEGAL and make temple bar, indeed the whole city centre, look such a complete dive. All these things are illegal (ie they don’t have planning permission) but Dublin city council fails to do ANYTHING proactive about it. I suspect a lot of people think Dublin city council exists to serve its employees rather than the public or the city. @Oscar: Indeed. You’d have to include Westmoreland Street in this. Beautiful buildings suffocating under an pile of tacky signage and sandwich boards. The Supermacs and Casino building are the personification of this. Beautiful historical buildings if you look above the first floor, but otherwise truly grotesque what they have been allowed to get away with. High time DCC took a trip out to Bray – in fairness to Bray Council they stuck to their guns with the placement of McDonalds in the Town hall and it is very discreetly placed there with minimal and tasteful signage. I don’t think we can ban tacky fast food joints from the city center, but we certainly could have a strict design plan to the street that they must conform to if they want to be there. What DCC needs to do is have a retail outfitting unit (including signage) and actually design the street itself, and only then let the retailers into the space. I don’t think we even need new systems or designs for this- there are great planning law and regulations already in place but they are not enforced. Planning is required for signage, flags, sandwich boards etc etc all of the stuff that disfigures our streets , but owners of property are effectively let police themselves. What does the DCC Planning Enforcement department actually do with their time???? The usual line from the council is “We act on complaints when received” which is utter nonsense when the problem of non-compliance is so total, ingrained, endemic. 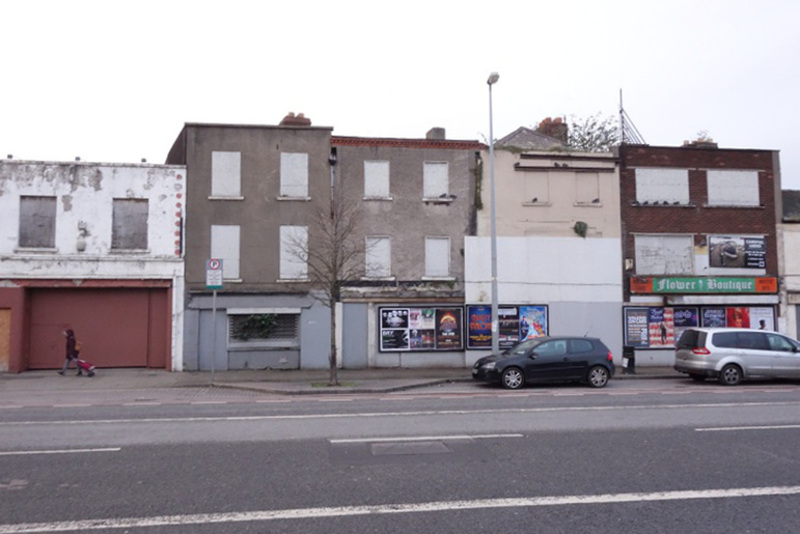 DCC need to get serious about planning enforcement otherwise they can throw all the money (our money) they want at temple bar – it will still end up looking a complete KIP within 6 months. @Oscar: Hey Oscar, yep they did also talk about that in the meeting and how enforcement should be better in the area, so we’ll see if that happens too. Re Temple Bar Square, it’s overlooked to East by the Eir operated telephone exchange. This is a fine historic building, Dublin’s first exchange. but It looks terrible due to poor maintenance and inappropriate security screens. At the far end of Temple Bar at Essex Gate is Isolde’s tower an important medieval feature, an outlier of the city wall that originally protruded into the river. The site is preserved under the apartments of the same name. But it’s barely visible due to poor lighting and surrounds have been allowed to deteriorate. It has turned into an eyesore but no-one seems to care. Opposite is a truly awful site behind Powells locksmith, derelict for decades. Imagine this is a prime Tourism location! Simply shocking.